Twitter’s use as a customer service tool is nothing new. I’ve occasionally tweeted my dissatisfaction with my telco or broadband plan, only for someone from the relevant companies to tweet back and offer to help. Social media is a great way to gauge what people are saying about your business and to engage with them in return. However, building a social media presence takes time. So what’s a quick way to encourage people to use Twitter to provide real-time feedback? Gatwick Airport came up with an award-winning answer. London’s second-biggest airport has signs and monitors in its terminals asking patrons “Are you on Twitter? 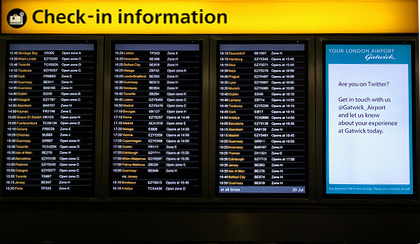 Get in touch with us @gatwick_airport and let us know about your experience at Gatwick today”. The airport already responds to comments on Twitter, however it claims this takes it one step further by actually integrating social media into the physical space of the airport, allowing feedback to customers when they need it. It’s a brave move considering airports are conducive to anger or stress. The scheme, which is intended to run 24/7, recently earned a gong at the Econsultancy’s Innovation Awards 2010 in the Innovation in Online Customer Service category. As the judges remarked it’s “a great way of transforming something boring into something interesting”. As the world gets smaller, we all get to share more big thinking. It doesn’t get any bigger than the American Museum of Natural History’s launch of Dinosaurs :IPad. Released to coincide with the holiday season, the app is something of a new media experiential coup. Extending, as it does, the thrill of discovering the Museum’s collection to a global audience. Featuring over 1,000 high-res images, the app not only delivers to subscribers fast access to all the facts. It also enables real-time chats with other dinosaur lovers at home or even on an exploratory dig. The really great thing is, this app doubles as a stunning advertising & PR device for the Museum’s forthcoming “The World’s Largest Dinosaurs” exhibition. Imaginatively created, to focus on a group of dinosaurs that lived for over 140 million years. Given the popularity of the baby elephants at the Melbourne Zoo, a Jumbo app could be a timely addition in the very near future. 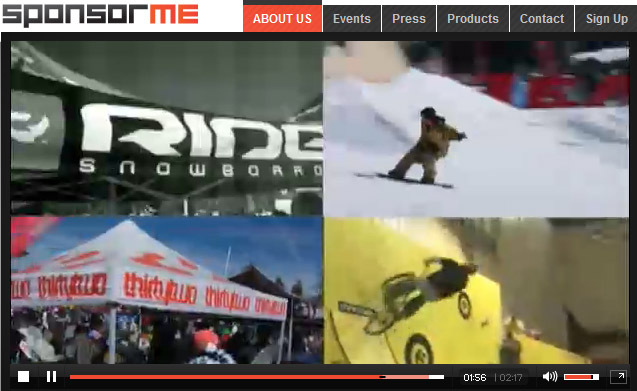 Sponsor Me has just launched the world’s first action-sports social media site sponsorme.com. The website aims to connect potential young sporting champions of tomorrow with today’s top sponsors. It appears to be a Win-Win. Adrenalin-junkies are also getting to see the hottest action –sports events live in HD across lots of different viewing platforms. iPad, iPhone, Droid Pad, Samsung Galaxy Pad and Google Pad are all in Sponsor Me’s sights. Endorsed by stars such as Sunny Garcia and Bruce Irons, live webcasts will cover high profile professional and amateur evenings including surfing, skateboarding, snowboarding and motocross. It’s all going off, with the Premier Online Action-Sports Competition offering $100,00 cash for the best video posting. Best put turbocharging my Rossignols on my things-to-do list pronto. In 1900, divers discovered the wreck of an ancient-Greek ship called the Anikythera near the island of Crete. The wreck, believed to have sunk a year before the birth of Christ contained a mechanical computer powered by gears and levers. It’s purpose mystified scientists and it took half a century before researchers realised this complex machine was used to calculate astronomical positions to predict future celestial events such as eclipses. Incredibly, the “Anikythera Mechanism” was believed to have been built around 100-BC had the mechanical sophistication of a 19th century Swiss clock and was 5000 years ahead of the first astronomical clocks made in the 14th century. It just goes to show that any idea, even ancient ones, can be unique again if you put your own special touch to it. What is social media? Is it tweeting your brand’s retail offers? Managing your branded Facebook page? Sharing company videos on YouTube? But we think it’s much more than that. We think it’s about involving an audience in your brand message. Exciting their senses; getting them to feel, think AND do something. Taking the brand message from the advertising channel and into their lives. That is what the ‘social’ part is all about. As for the ‘media’ bit, well we don’t believe that it’s necessarily confined to social networking platforms either. Instead, we like to look for socially engaging ways to utilise the most effective media channels for each target market. That’s why we love this cinema campaign by BMW. BMW have found an impressive way to engage cinema audiences by using an image projection technique that leaves viewers with the BMW logo on their retinas once they close their eyes. Truly innovative for a cinema spot. Not only that, the spot has all the tell tales signs of a BMW piece. It’s highly emotive, beautifully shot and taps into all the BMW brand propositions. Even I, as someone who’s never driven a motorbike, felt the adrenalin pump through my veins…. And the takeout – the logo etched in my mind (literally) was just the icing on the cake. It’s a wonderful example of innovating in traditional media in a way that takes the brand into the lives (or the body in this case) of the audience. Now who’s up for a test drive?